LinkedIn is a professional social networking medium which was launched in 2003. The main activities of LinkedIn social networking is to provide a professional portfolio and personal experience in such social media. It is similar to Facebook and Twitter, but it delivers certain service completely different from these social media networks. A LinkedIn profile will be created to provide a professional exposure to a person who wants to increase their networking. These kinds of social media networks are mainly concerned with their number of profile viewers involved in that particular social media. There are some LinkedIn tips and tricks to follow to increase profile views in the LinkedIn network and they are as follows. These social networking sites create an external appearance of one’s portfolio. These portfolios can build network connection with other LinkedIn profiles. And to make that happen the profiler need to create a LinkedIn profile or account and update all the new features of the profile. Constant update of new things around the world can increase a certain level of viewers to the social media website. Therefore, to increase LinkedIn viewers, a profiler needs to update the newest features of one’s profile. Because of recent development in social media, a LinkedIn profiler needs to understand the importance of creating a blog where he/she can publicize all the elements of his / her LinkedIn public profile to increase the number of viewers to their profile. Therefore, creation of blog can benefit a profiler to increase his / her viewers of their LinkedIn profile. A company can be created with its image among its customers and similarly, a profile needs to understand one thing, if he/she really want increase the number of viewers to his / her LinkedIn profile then they need to keep updating new images of their professional image. If a person needs to start networking for the sake of his / her successful professional growth, then they need to create an image where it can attract potential viewers. A profile needs to understand the needs and wants of his / her profile where he/she can attract more viewers to his / her LinkedIn profile page. Creating a vibrate or an active profile can increase the number of viewers to the LinkedIn profile. Therefore, by adding such vibrant profiles, a profile may get an idea of attracting more viewers to his / her profile. And such vibrant profile creates a difference of viewer opinions for the sake of popularity. A profile creator needs to know the value of catchy headlines, to understand the value of such catchy headlines he/ she may need to create a statement where he/she can connect with most of his / her friends by just a statement of communication. Similarly, when a creator writes or uploads some catchy headline, there is a possibility that most of the viewers may be interested to check what really it is. Therefore, it is necessary to provide a catchy headline to attract their target viewers for the LinkedIn profile. To increase the number of views in such social media websites, a creator of such profile needs to understand one thing and that is to make sure his / her profile creation should be customized in a public profile. It is necessary to keep a public profile visible because it is possible that his / her LinkedIn profile may get more number of views through such customization of public profiles. Most of the time it happens that these social media websites have certain forms of projection of their social website. And a person who has created such account in those social media should start enabling those image of social media, which can help a person to make its visibility turned on so that his / her profile receives more viewers. All these measures of increasing viewers rate help them to be more popular in their business. As already mentioned about blog creation, a person needs to make sure of certain elements to popularize their personal blog. And to make that happen a person needs to create a small badge of his / her LinkedIn profiles so that it can attract more potential viewers to his / her LinkedIn profile. Therefore, creating such badges may create a difference of viewers to their LinkedIn profile which can increase in the number of viewers to their blog and as well as their LinkedIn profile. Search engine optimization is required for a blog or website creation, to make sure of that his / her website or blog should attract more potential viewers. To increase the number of viewers to a certain blog or a website, a person needs to start creating search engine optimization techniques which can help them to find a keyword that creates an increase of views to his / her LinkedIn profile. Therefore, it’s important to learn more about search engine optimization. Creating a sample which is connected to a LinkedIn profile helps a person to attract more potential viewers to that particular blog or website. The most common element that a creator of such social media account needs to understand that these websites or blogs are created for the sake of professional approach towards better business growth and success. Therefore, the creation of such sample work can build a design of a website which can automatically increase their number of views in a short period of time. It is better if a person understands that a little change in certain things of our life may help us be more creative. Similarly, a website or blog needs to be updated regularly so make sure that its viewers are not getting tired of seeing something in common. Therefore, a certain level of makeover can create a difference of viewer’s interest in such website or blogs. And change brings a new environment among people and it can be followed in such website creations also. LinkedIn helps in searching for new job search availability. A LinkedIn profile creates an image where a person can start building his / her professional networks by joining similar business proposals through LinkedIn profiles. Therefore, a person being a part of the LinkedIn profile can increase their visibility by participating in such business activities. A LinkedIn profile can help a person who is looking for a certain type of job, get hired within a fraction of seconds. A person interested in a certain job can upload their resume in LinkedIn profile so that he/she can build networks for the sake of his / her dream job. A person can even turn his / her LinkedIn profile into Job search portal within a second and such change can increase the number of views of the particular website or blog. A person who is an active LinkedIn member and one who has a good LinkedIn profile can create or advertise a certain type of job availability in their profile to hire an interested candidate for the job. Most of the time it happens that because of the certain network building process, a person would directly get approached from another employer which can offer him/her better benefits of safety and security. Therefore, a LinkedIn account can help a person find himself/herself a better job as well. To increase LinkedIn profile views or to improve LinkedIn profile, a person needs to advertise his / her skills in the profile clearly. 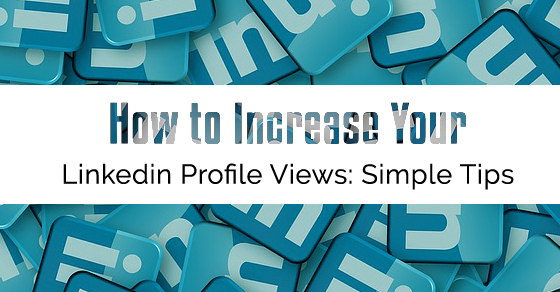 This is one of the best ways of increasing the number of views to the LinkedIn profile. Therefore, advertisement of such professional skills can make a difference in the job market because there may employers who require such employees in their company to achieve success. As this discussion started with a key element or a question of how to increase views of the LinkedIn profile. With the help of tips for LinkedIn mentioned above, we have answered certain ways of increasing the views of such LinkedIn profiles. These tips or guidance can help a person create his / her own LinkedIn profile without any help. And for a person who already owns a blog, it is a golden opportunity for them to advertise their blogging ability through such LinkedIn profiles.